If you’ve been reading my blog for any length of time, you may recall that my father, Bob Merrill, passed away a while ago. In fact, it was three years ago today. A hard day that time has most certainly softened, as is meant to happen. I don’t cry every time I think of him any more, we can make jokes about him coming to haunt us and I enjoy mimicking him and some of the funnier expressions he used to use – it keeps him alive. Shopped for the window treatment fabric. After month’s of searching on both my parents parts for the exact shade of blue they wanted, he found it. He then measured and ordered the treatments, which did not come mounted to a board, he did the board mounting and hung them. He also probably selected and hung chandelier. And refinished the table top once or twice over the years and covered the slip seats. This was one ugly room when they bought the house. 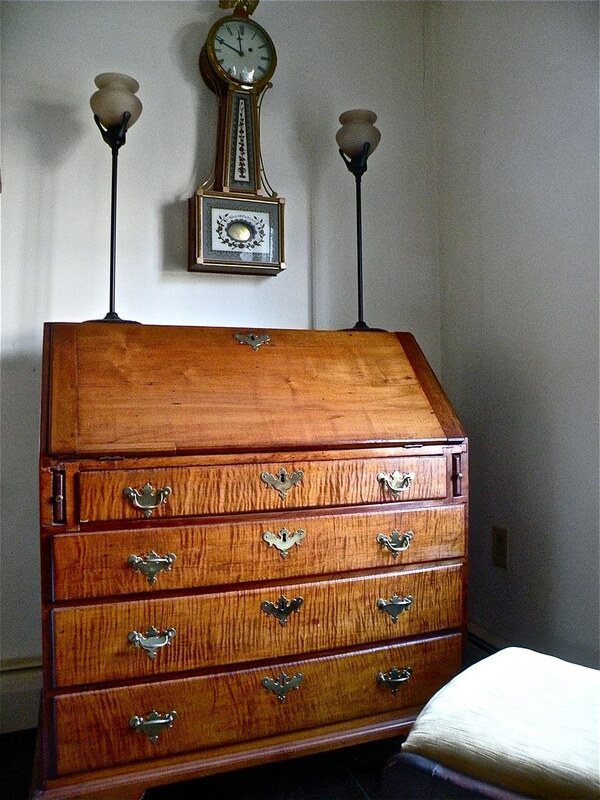 This secretary desk dates to the 18th century and my Dad and his Dad found it in a barn sale somewhere in northern Massachusetts or Southern New Hampshire probably in the 40s. The story goes that it was covered in pea soup colored paint and the original base was missing. They restored the entire piece, adding a new base and refinishing. 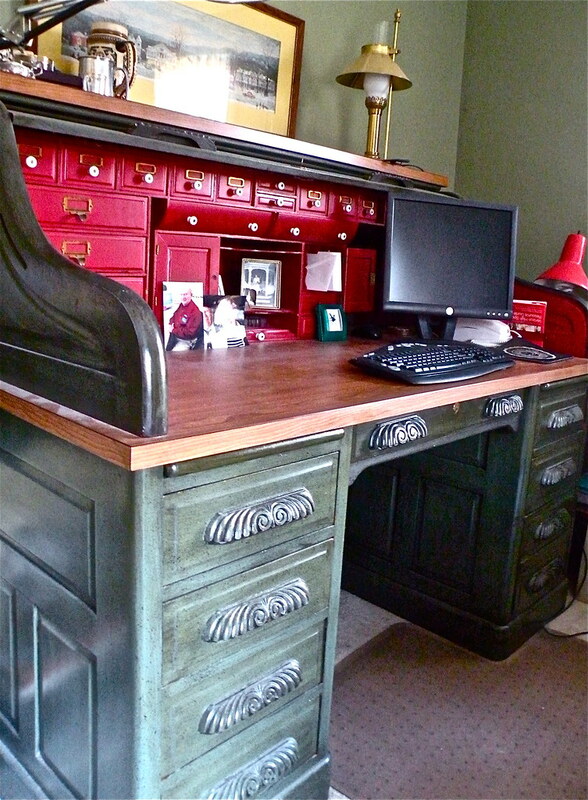 Of course, antiques experts probably scream over that sort of thing – but this is much better than a pea soup green desk! This is the story I always heard. I asked my mother and she said this was the story she’d been told when they first met, but years later my Dad said no, they did buy it in a barn sale, but brought it somewhere to be stripped and restored. Somewhere in the middle is the truth because I am certain I talked with my dad about the ogee foot base and how it wasn’t accurate to the desk, but that’s what he did. So, it’s a bit of a mystery. I prefer to stick to family legend that he and my grandfather did the refinishing themselves. Normally the cubbies are filled with the usual stuff one hides away in a desk. I moved all for the photos – but the dust obviously. The secretary was always in my parents living rooms in our various homes and usually just held photo albums, playing card, etc. 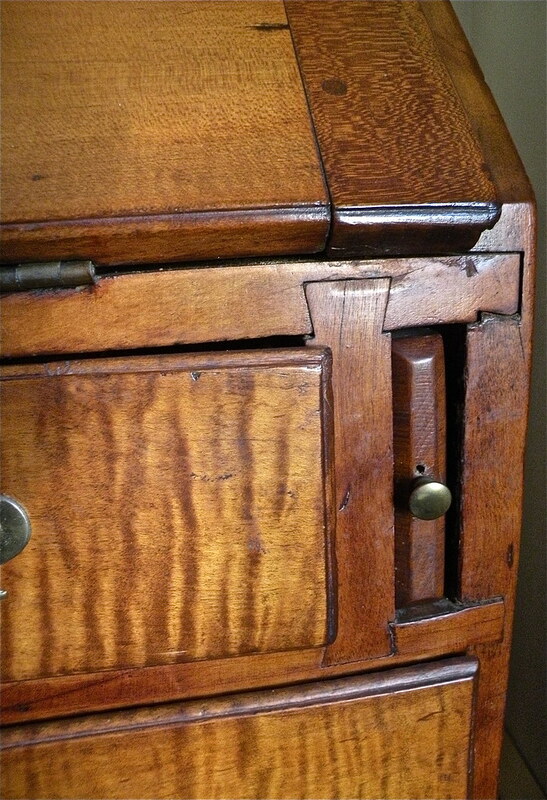 The real working desk of the house was this massive 19th century oak roll top desk below. Sometime in the late 1960’s, my Mom came home to find a pile of gnarly-looking oak drawers and various other pieces and parts in the middle of the garage. He must have been poking around an antiques shop or junk yard, who knows. 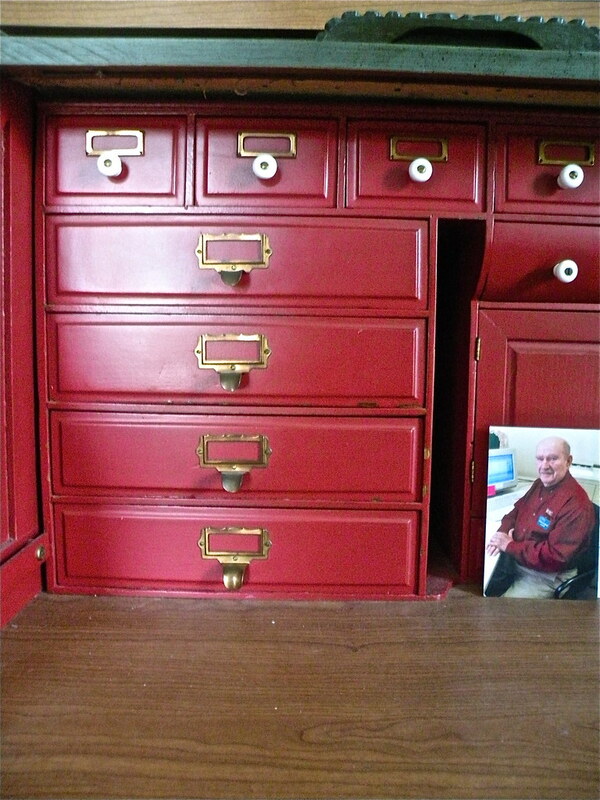 My dad completely rebuilt and painted the whole thing – replacing all the brasses and porcelain drawer pulls. 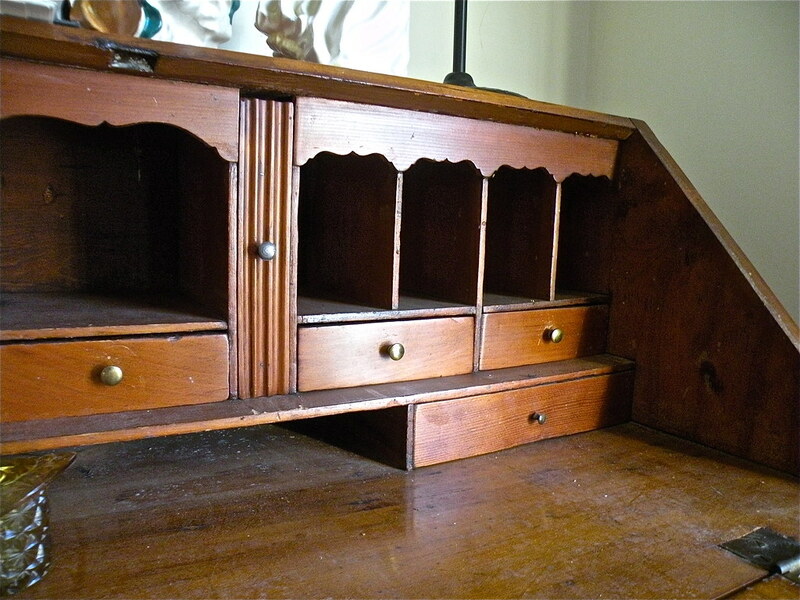 The original desk top was missing, so he used a “wood look” formica top which was a popular choice in the 1960’s. While it may not be today’s choice, it worked and has held up beautifully. A little story about the beautiful carved drawer pulls. Apparently, these were also missing, or perhaps one remained. He brought the single pull – or maybe it was a photo – to a local wood carver and ordered 10 large and 2 small hand carved wood pulls. When he went back to pick them up, he asked how much was owed and the man said “no charge, you can’t afford it”. How nice was that? A true craftsman who took so much pride in his work that he was willing to do them for free because he didn’t want to lower the cost by cutting corners. This desks holds everything. My eldest brother is making plans to move the beast to his house. Dad would be very proud and possibly surprised how much we value his handiwork. And, yes, that’s him in the pic when he volunteered at the Rehab Hospital of the Cape & Islands (now Spaulding) after he had his stroke and they helped get him back on his feet – literally. Dad made this grandfather clock in an adult education woodworking class in the 1970’s. He had found plans for the clock somewhere – perhaps from an ad in Woodworker’s Digest or even their bible Colonial Homes. Truth be told – there are no works – the hands are attached to a small battery pack and the case is empty – shhh. 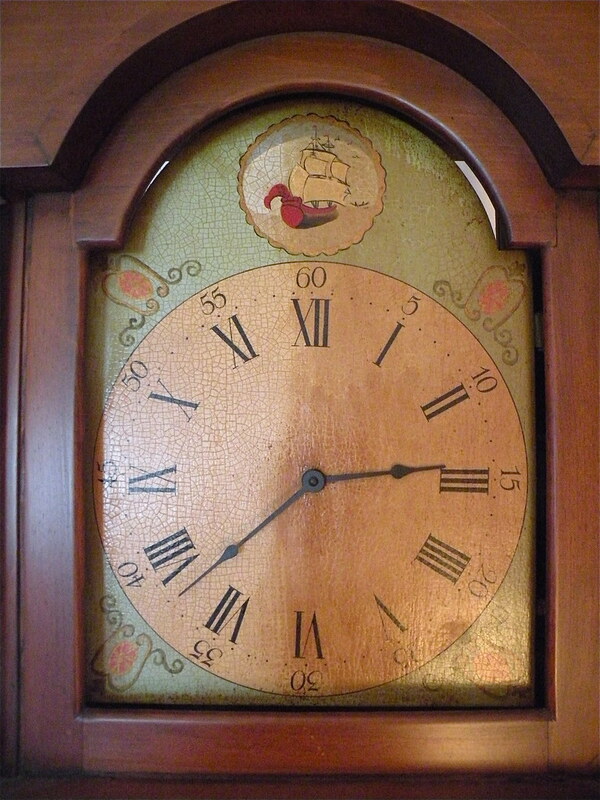 The clock face was painted by Dad’s sister Better Merrill Wasserboehr and her husband Paul Wasserboehr. Bette was a fine art painter and Paul was a graphic illustrator. 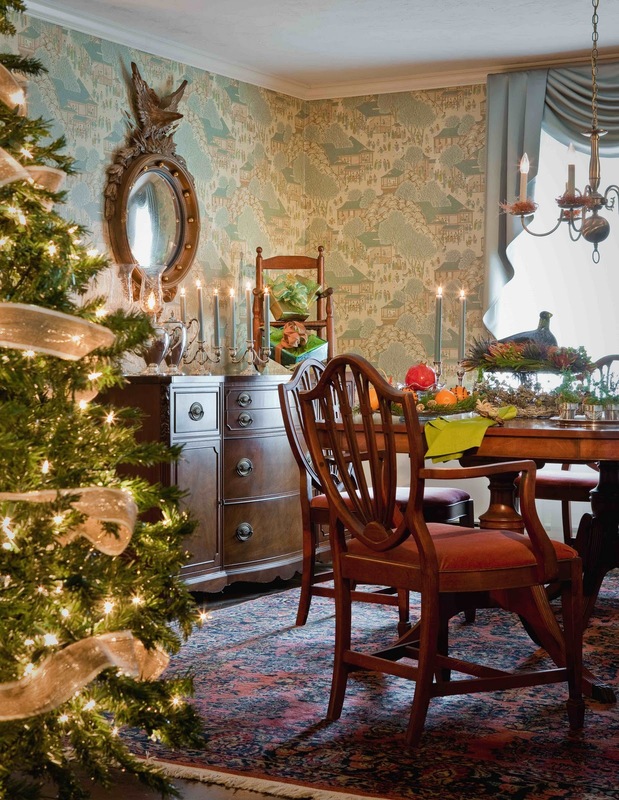 She did the background and decorative motifs and he did the numbers – by hand. 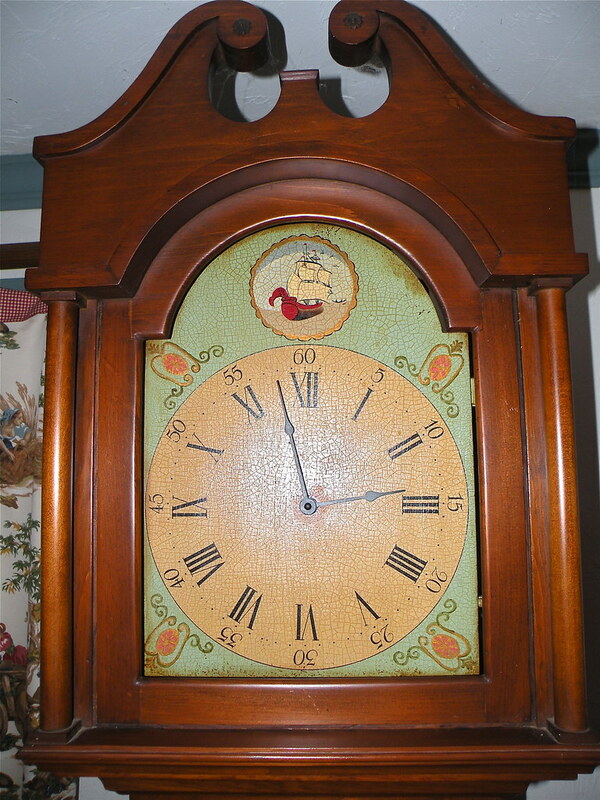 Dad must have cut out the face to fit the clock and built it and they did the painting. There are actually two faces – the one in the clock and an all off-white one which I’ve had for several years. Since it was built, the clock has been in an open space kitchen/family (in two different houses) and has gotten grimy (not to mention both my parents used to smoke). So, between kitchen grease and cigarette smoke – yuck. I spent some time today cleaning off the clock face with simple paper towel and water. It could probably use a soft brush and water with a very mild detergent, but since I can’t easily get it out of the clock, I did it in situ. The above pic shows half the clock face cleaned – amazing and gross, huh? And how it looks now. At some point I’ll pull the bonnet off and really have a go at cleaning it up a bit more. Although it looks great with some age showing, it could stand to look a little better. Every year that I’ve done a post on this day, I include a piece of music. My Dad loved music. This year’s selection is Frank Sinatra’s “That’s Life” My Dad played this album all the time when we were little and it’s very much part of the sound track of my childhood. So, raise a martini and tip of the hat – this one’s for you Daddy!